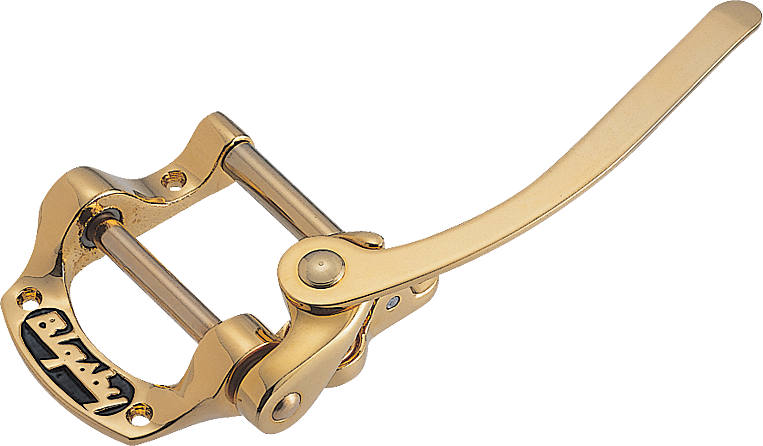 The B5, sometimes referred as the Bigsby "horseshoe" is designed for flat top solid body guitars. Attaching via four screws to a guitar's top, the B5 is extremely versatile. B5s are common on many styles of guitars including SGs, Les Paul Jrs, Telecasters, and Rickenbacker 325s. Aluminum P-GB5-A Weight 0.8 lbs. Gold P-GB5-G Weight 0.82 lbs. All models Packaging Dimensions 7.9 in. x 4.4 in. x 2.5 in. 1 answers Does this come with the bridge, bridge/pickup mounting bracket, and hardware needed to mount? As bigsby offers several different types of bridges for their vibrato units, one is not included with this kit, nor are pickup mounting brackets. The mounting screws, spring washer, and spring are included with this vibrato. 1 answers Hi would this Bigsby trem fit on a B.B. King Lucille Epiphone 335? Yes the Bigsby B5 and B7 will work on a Epiphone 335 but both will require permanent modifications to your guitar. One option is to use a Vibramate V5 (Item ID: 005010) or V7-335-E (Item ID: 039555). 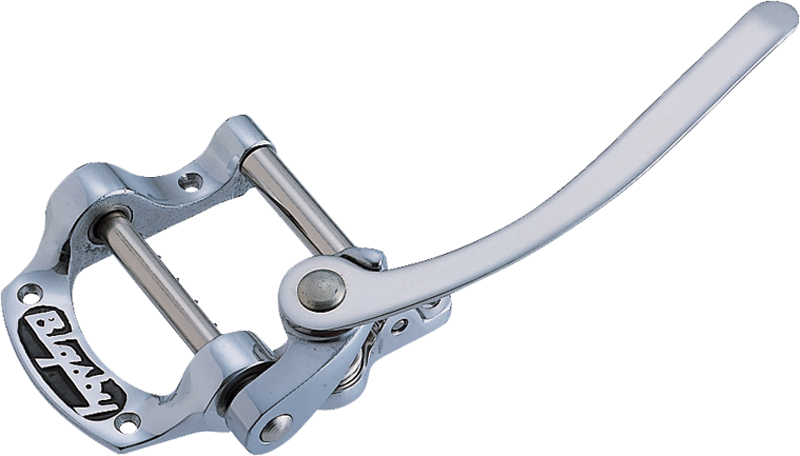 This allows you to put either Bigsby on your guitar but will not require drilling any holes. 1 answers Are you aware of any problems installing the B5/VibramateV5 on imported Epiphone SG's? Thanks. The V5/B5 combo is designed to work with flat top guitars using a tune-o-matic style stop tailpiece. Included are the mounting screws for import and domestic guitars. There should be no problems mounting this to an Epiphone SG. 1 answers Will this work with a standard telecaster thinline? This should work with the guitar in question, yes. 1 answers This product I ordered did not in fact come with the bridge, only the vibrato, is this supposed to come with the bridge as mentioned in one of the questions above? The answer to the previous question has been altered to accurately reflect what is included with this vibrato unit. Only the mounting screws, spring washer, and spring are included with this unit.